echo "kill world id=$i successfully"
One of my colleagues’ account was constantly being locked out. I suspected that he had used his account to run a service, or other automated task on a server and I needed to find out which one. As I’d previously used the Microsoft “Account Lockout and Management Tools”, I downloaded the latest version from here (http://www.microsoft.com/en-gb/download/details.aspx?id=18465). There are two useful utilities “LockoutStatus.exe”, which shows the state of a specific account on each domain controller (useful to identify which DC is locking out the account) and “eventcombMT.exe” which gathers the event logs from all the DC’s and parses them for specific events. Although the package runs on 2008 and later OS’ (you need to run it as an administrator, with read access to your domain controller event logs), it only searches for the Event IDs that were valid for Server 2003 and earlier. Luckily Microsoft has published the new Event IDs for Server 2008 and later (See: Description of security events in Windows Vista and in Windows Server 2008:http://support.microsoft.com/kb/947226), and the new event id I required was 4740 (“A user account was locked out”), but I also included 4625 (“An account failed to logon”). On the Searches menu, point to Built In Searches, and then click Account Lockouts. All domain controllers for the domain appear in the Select To Search/Right Click To Addbox. Also, in the Event IDs box, you see that event IDs 529, 644, 675, 676, and 681 are added. In the Event IDs box, type a space, and then type 4740 4625 after the last event number. Once the search has completed, you should be presented with the output folder (by default it is in C:\Temp) with two or more small text files with the events listed – these should help you identify which machines are causing the lockout. Normally when we do show command we make use of the “|” to filter and put in keywords after like include, exclude, begin and section. As we all know “include” means show only that matches the string like for the example below. We can do some multiple command filtering like the example below using the “include” keyword. Let’s say we want to see the interface name, then the description, the OSPF cost and if its configured with the “mpls ip” command. The trick is to use multiple “|” and then the regular expression “^”. Then put a space before the string because the configurations under the interface configuration if you do a “show run” has a space before the line. This also applies to the “exclude” keyword but who the heck uses “exclude” that much? If you migrate Windows installations between storage adapters, you’re often left with the well known STOP 0x7B INACCESSIBLE_BOOT_DEVICE. This happens because Windows doesn’t yet have the required drivers installed, and/or set as boot-critical. The dism.exe tool allows us to install (boot-critical) drivers into an offline Windows “image”. Note that an offline Windows “image” is nothing special – a regular Windows install is a valid Windows “image”. I want to police customers traffic into 20mbps. When we try out a new linux OS its always a pain to download and install all the software and add packages we needs on that. Its even worse if you don?t have an unlimited connection. But actually most of the software we need is already there in the CD/DVD in which the operating system comes with. So how do we install from the DVD then rather than from the internet? For this you need to add the DVD as a repository so that rpm client picks up the rpm from the DVD and wont go to internet for it. The Procedure and Files to be modified is a bit different for each OS so i will cover Red Hat Linux in this post. In RHEL the repo list is maintained in the folder /etc/yum.repos.d/ . So lets create a new file in this directory , say lets call it rhel-cd.repo. First line ([rhel-cd]) should be an unique value ie no two repo file should have the same value or it will show a warning. Name can be anything it is for the user to identify it when its shown though the rpm interface. baseurl should point to the DVD mount point. For this we first identify the file repomd.xml. This file should be in the folder repodata. Thus we should include the folder path to the parent folder to repodata in the baseurl. enabled should be 1 if the repo should be taken by rpm on searching for sources. gpgcheck can be enabled if you have the gpg file for the cd. Lets leave it disabled for now. Now you can install new rpms from the DVD by using yum command. The content of this post is from http://blog.sriunplugged.com/linux/adding-redhat-dvd-as-repository/. Want to make sure i give credit to source. So lets say you want to open a new PuTTY session to a certain IP Address and have it automatically enter your username for you. Now lets do the same thing but with a password too. The two above are fine if you don’t need to use any of the provided settings you get from within PuTTY (e.g. Tunnels, Proxy’s, Color Schemes etc) but if you’re like me and you need to use Tunnels to tunnel into a server using a number of ports then the simplest way to do is this to create a new PuTTY session and then use the following parameters. First you have to set up your FVS318 router to accept the connections. Log on to your router and go to the “VPN Wizard” in the left hand menu. You have to set a name for your connection and a pre-shared key (PSK). Select “A remote VPN client” as connection type. You will get a confirmation screen next. Just click “Done”. Ones installed it’s time to set up your new connection. 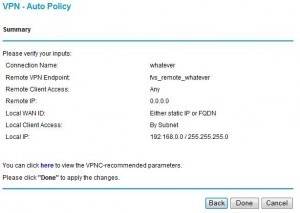 In the router admin page select “IKE Policies” in the left hand menu. The two pieces of information you are interested in is “Local ID” and “Remote ID”. 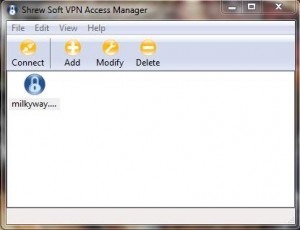 Now start Shrew Soft VPN Access Manager and click “Add”. 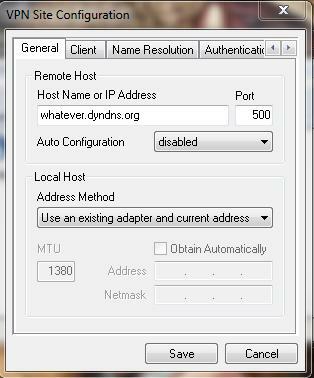 Now enter your DynDNS, or static WAN address if you have one, in the “Host Name or IP Address” field. Set “Auto Configuration” to “disabled”. Set “Local Host” – “Address Method” to “Use an existing adapter and current address”. Now go to the “Name Resolution” tab. 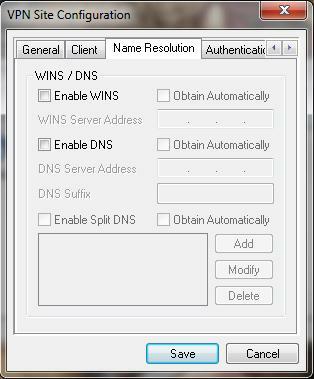 If you know the addresses to wins server and/or dns server on the remote network enter them here. If not uncheck the check boxes. 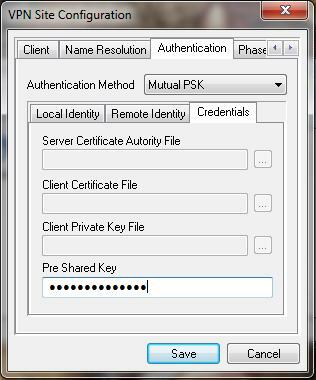 Now go to the “Authentication” tab and set “Authentication Method” to “Mutual PSK”. “Local Identity” should be the field “Remote ID” on the routers “IKE Policies” page. “Identification Type” should be “Fully Qualified Domain Name”. 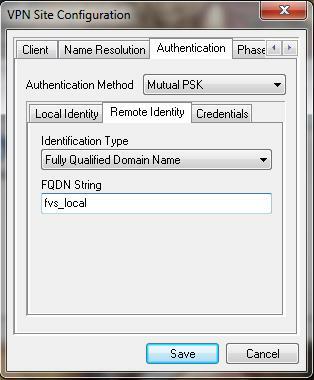 On the “Remote Identity” tab the “Identification Type” should be “Fully Qualified Domain Name” and “FQDN String” should be the “Local ID” from the routers “IKE Policies” page. 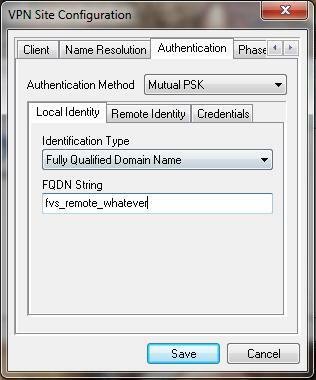 Moving on to the “Credentials” tab fill in your PSK in the “Pre Shared Key” field. In this case “areallylamekey”. Then you go to main tab “Policy”. Uncheck the “Obtain Topology Automatically or Tunnel All” check box. Type in your network. 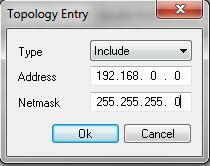 To route all the 192.168.0.x addresses over the VPN tunnel enter address 192.168.0.0 and netmask 255.255.255.0. If you have the same network address range at home and in your current location you can enter specific addresses or add an other topology entry that excludes those addresses. Then hit “Save” and you will return to the mane window. Dubbel click your connection and select “Connect”. That’s it! Your now up and running with your own secure IPSec tunnel to your home or office! The content of this post is from http://www.hackviking.com/2010/10/ipsec-vpn-with-netgear-fvs318v3/. Want to make sure i give credit to source.